Visit the Petal and Wild wedding flower blog for up to date inspirational floral design ideas, blog posts, articles, news, and tutorials. Learn all about wedding flowers and floral designs on our blog. As the nights are drawing in and the trees are showing off their best autumn colours, I’m reflecting over the last wedding season, and the amazing range of British blooms I’ve been lucky enough to work with. 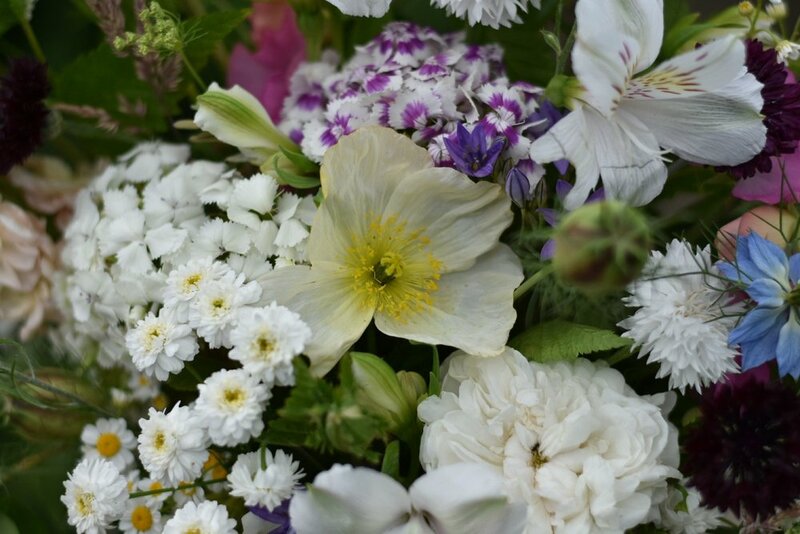 There’s something very special about styling British grown flowers – a more natural, organic and free-flowing quality. Bringing the outside indoors is one of the delights of wedding floristry, and it becomes so much easier and more joyous when the flowers in question aren’t travelling enormous distances to reach the venue. Every June, there’s a whole week of celebration for what this country has to offer. During British Flower Week, lots of the UK’s growers and flower farmers put on workshops and tours for florists and flower enthusiasts to find out more about the provenance of the blossoms and blooms they work with. It’s a great chance to meet others in the industry, and to get creative with varieties that we perhaps don’t work with as often as we might like to. This year, I visited Cathy Marchant of The Midnight Garden Flower Farm near Newmarket, to take part in an urn styling workshop during British Flower Week. Cathy is a passionate grower and floral designer, and I can count on her for beautiful and well-cared for seasonal flowers. I regularly source flowers for my brides from The Midnight Garden Flower Farm, and Cathy’s stunning Georgian walled garden and Victorian glasshouse is a treat to spend time in. I had such a lovely time with Cathy at the workshop. We had gorgeous weather, and it felt really special to be able to immerse myself in something creative just for fun and with no specific brief to work to. My finished urn was a bit of an homage to early summer. I used a palette of clean whites and greens, and added pops of ice-cream tones in pale yellow, lilac and pink. The overall effect was youthful and fresh, and it contrasted really nicely with the formal grey stone of the urn. I’m really pleased with how it turned out, and knowing that I was working with flowers grown and gathered from just a few feet away made it all the more enjoyable. Now, it’s not always possible to use 100% British grown blooms – there are certain varieties that simply fail to thrive in our climate. However, the UK boasts an absolutely enormous range of flowers, and I’d love to see more brides and grooms taking an interest in where their bouquets, buttonholes, arrangements and installations come from. For me, it’s the equivalent of your weekly food shop. Choosing locally grown blooms is like visiting your artisanal food producers – the butcher, greengrocer or farmer’s market – rather than heading to the supermarket for a one-stop shop. Flowers grown locally tend to be better quality for weddings – they’re more used to the English climate and they’re likely to be more robust having not been flown or otherwise transported from Holland, Colombia or South Africa and risked being crushed or damaged in transit. There’s a real range of dedicated and talented flower farmers in the UK. As well as The Midnight Garden, I regularly source from The Real Flower Company, Usk Valley Roses, Tregothnan and the Irish Green Guys, to name a few. If you’re in the midst of planning and starting to think about your flowers, I’d love to talk to you about the options available. Get in touch, and let’s have a chat about how to include truly seasonal, British grown blooms into your wedding-day flowers. I promise you won’t regret it. © Petal & Wild 2018. All rights reserved.